I read there wasn't an "I" as Juve stole it. Nah, too many people prepare things like that so mistake would be noticed. Soooo what is the point of the missing "i" ? I dont know but choreography "M_lano" if would be human mistake would be as a word adjusted so would looks like Mlano without left space - so CS with intention tried to say something by that. What exactly i dont know, ask italian users about what people from milan said about it. - against raiola rumors about donna to juve, rumors about alessio, cr7 strange deals with not official money going to agents etc. No statement on explanation + ultras don't call themselves "Curva Sud M_lano" + "i" used in message on the ring multiple times + there have been way bigger fuckups. Still nothing on "comeback", eh? 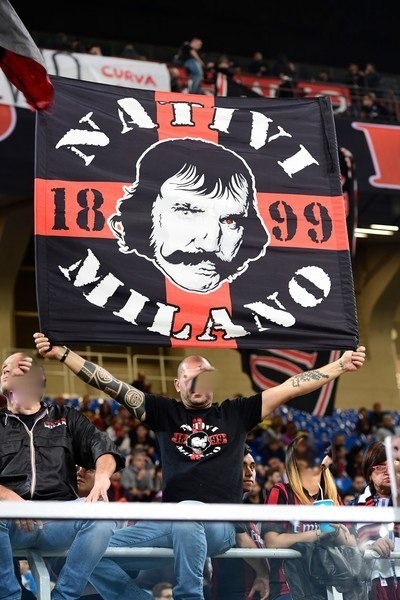 Who is the stache on Nativi Milano flag? all of these new banners every year. where is the commandos tigre flag??? did they retire?? As an aside to the positives on the pitch, what a difference has the return of Fossa dei Leoni made to the curva. Home and especially away atmosphere is on a different level to the previous 10 years or so.